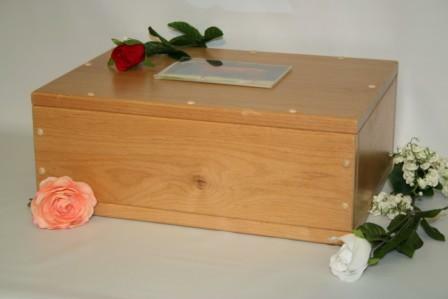 Description A large capacity hand crafted urn with chest like styling and decorative button screw caps. It is constructed of solid North Pacific Alder Hardwood and finished with durable natural lacquer. Includes 4"X 6" acryilic photo frame as shown. Available in 600 or 1300 cubic inch cappacities.